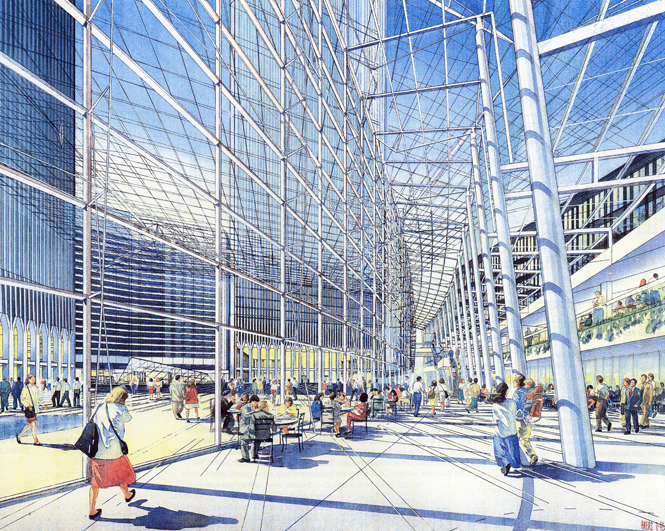 In 1992 the Port Authority of New York & New Jersey, owner of the World Trade Center, commissioned Davis Brody & Associates to develop a master plan for the redevelopment of the Center’s public spaces. 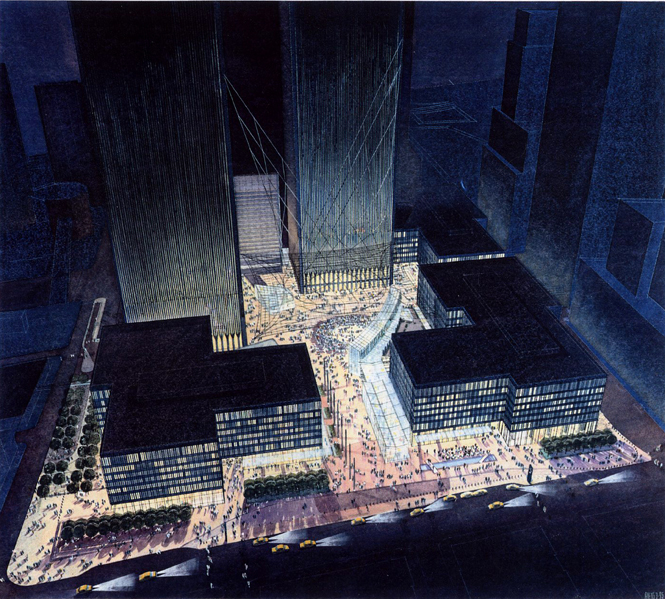 The public spaces of the World Trade Center complex included the large open-air plaza plus 500,000 square feet of interior retail and circulation space on four different levels. In 1994 a schematic design was developed to better define the architectural components of the master plan. These components included a monumental screen covering the existing plaza, new plaza structures adding restaurant and retail space and providing new access to the concourse level below, new street-level retail space along the Center’s perimeter and a new public park surrounding the complex. 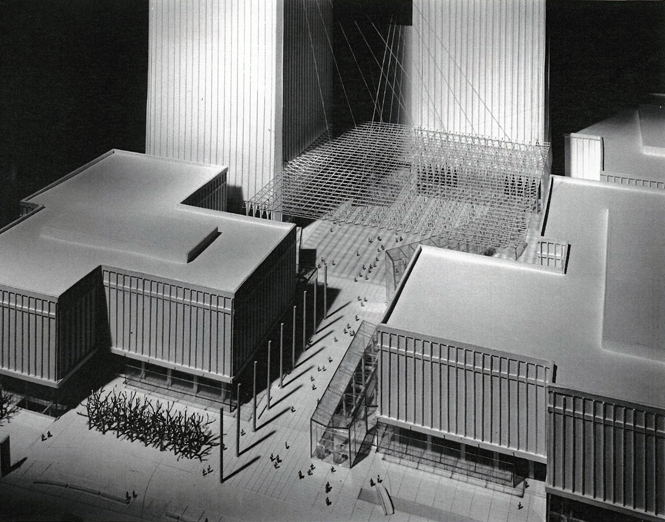 A major feature of the redevelopment project, the plaza screen was designed to accomplish the following tasks: (1) visually define and unify a three-dimensional multi-purpose outdoor space; (2) mediate the strong cross winds created by the twin towers; (3) serve as a staging element for temporary plaza events. Hung with support cables from the adjacent towers, the plaza screen would require no additional vertical supports on the plaza or concourse levels. Visible from well outside the immediate vicinity, the support cables would serve as a symbol of the New World Trade Center. Another principle feature of the Center’s redevelopment is the crescent shape North Plaza Building. The 60-foot tall, fully glazed structure would contain dining and interior circulation space along the northern edge of the open plaza. The design successfully creates an appropriately scaled focal point for the Plaza as it provides a single, unified identity to the various tenants and functions of the building. The schematic design also included a refinement of the master plan’s new concourse level shopping complex. This work included the enhancement of circulation patterns and user orientation, the development of the architectural aesthetics and the integration of structural, mechanical and lighting systems throughout the retail complex.